Get Safe Online Week Kicks off in the UK – Don’t be a Target! Online crime is always personal. Cyber criminals are experts at using the data people innocently provide online to defraud or steal their identities. Educating the public on Internet security is essential for increasing safe and confident online use. Each October in the UK, Get Safe Online week reminds individuals and business how to stay safe online. This year, the theme is “Online crime is always personal. Don’t be a target.” At Symantec, online safety is a core corporate responsibility effort. Our Online Safety in the Community volunteer program encourages employees to become ambassadors for safe Internet use in their communities. Year round, we collaborate with local schools and organizations to deliver online safety workshops. One of our community partners, TeenTech, organizes engaging, hands on events across the UK that draw over 500 pupils per event from the surrounding regions. 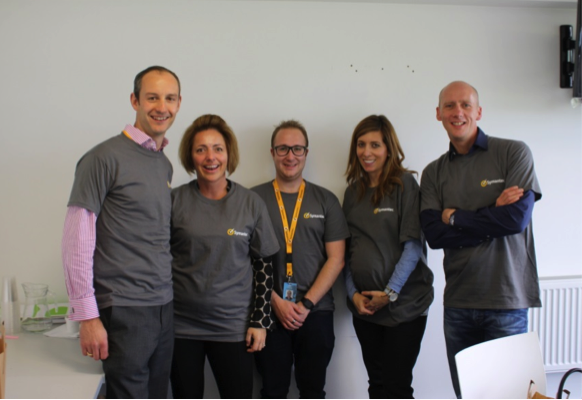 Earlier this month, 15 Symantec employees volunteered at the Bristol event that took place on October 8th to deliver an interactive hacking game scenario. The hacking game, designed by Symantec employees, was facilitated to pupils from local schools in the area. The volunteers delivered 30-minute sessions on cyber security educating them on how much data we inadvertently put online that allow hackers to guess our passwords. The overall aim was to inform them on why creating secure passwords is so important. “It is great to be able to use the skills we have to educate, inform and inspire the next generation,” said James Hanlon, one of the Symantec volunteers. We’re looking forward to the London TeenTech event that is coming up December 1st!